Explore resources related to STEMM, Female Leadership, Sustainability, Innovation, Exploration, Diversity, Climate Action, Alternative Energy, Adventure, and pushing our boundaries! Despite relatively cool summer temperatures, observations in 2017 continue to indicate that the Arctic environmental system has reached a “new normal”, characterized by long-term losses in the extent and thickness of the sea ice cover, the extent and duration of the winter snow cover and the mass of ice in the Greenland Ice Sheet and Arctic glaciers, and warming sea surface and permafrost temperatures. Some areas of the Arctic Circle are experiencing faster rising temperatures than the West Antarctic Peninsula. However, since Antarctica is a big place, climate change is not having a uniform impact, with some areas experiencing increases in sea ice extent. Yet in others, sea ice is decreasing, with measurable impacts on wildlife. ASOC believes that understanding climate change impacts on Antarctica is a matter of critical importance for the world and for the continent itself. Local Antarctic effects of climate change are only part of the problem. Antarctica comprises two geologically distinct regions, East Antarctica and West Antarctica, separated by the great Trans-Antarctic Mountains but joined together by the all-encompassing ice sheet. The presence of the high ice sheet and the polar location make Antarctica a powerful heat sink that strongly affects the climate of the whole Earth. Furthermore, the annual sea ice cover around the continent, which seasonally reaches an area greater than that of the continent itself, modulates exchanges of heat, moisture, and gases between the atmosphere and ocean and, through salt rejection when it freezes, forces the formation of cold oceanic bottom waters that spread out under the world’s oceans. Alterations to this system will affect climate all over the planet. Both the ice sheet and the sea ice are potentially subject to change in a changing climate; the ice sheet, in fact, may be changing now in response to past climate change. 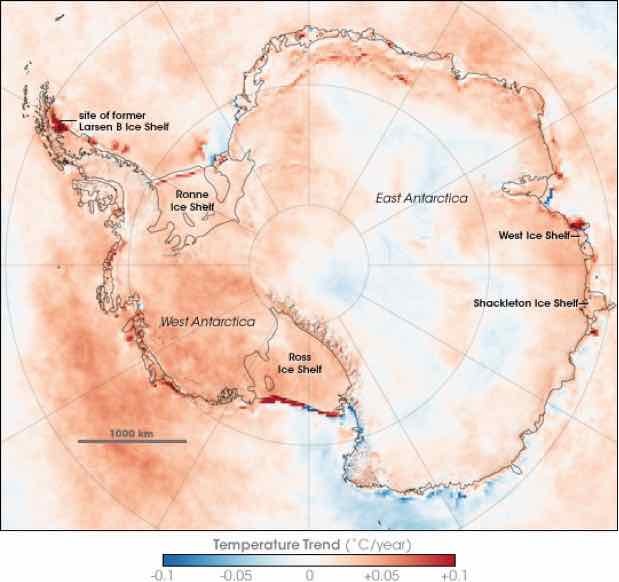 The greatest threat to the inhabited world comes from the West Antarctic ice sheet (WAIS), which rests on a bed far below sea level and so may have the potential for rapid shrinkage. The Antarctic is so vast, remote, and difficult to monitor, however, and the physical behavior of the ice sheet so complex, that there is as yet no definitive demonstration (or disproof) of such change, even though a pronounced climatic warming is ongoing in one northerly portion of the continent. The Antarctic ice sheet contains sufficient ice to raise world-wide sea level by more than 60 meters if melted completely. The amount of snow deposited annually on the ice sheet is equivalent to about 5 mm of global sea level, as is the mean annual discharge of ice back into the ocean. Thus, a modest imbalance between the input and output of ice might be a major contributor to the present-day rise in sea level (1.5–2 mm per year), but the uncertainty is large. Antarctic species are dramatically impacted by climate as well. Krill often feed on algae underneath sea ice and populations have been declining around the West Antarctic Peninsula as sea ice has decreased. Adélie penguin populations have been declining in recent years due to reductions in krill populations and changing weather conditions in their traditional nesting areas. Emperor penguins are highly vulnerable as well and are predicted to suffer when the world’s average temperature increases by 2 degrees Celsius. Furthermore, a 2008 study has identified Antarctic toothfish as highly vulnerable to climate change. Climate change in Antarctica will thus have dramatic effects both globally and locally – and perhaps harm some of the world’s most beloved species. The Antarctic and Southern Ocean Coalition (ASOC) acknowledges and supports the world-class climate research conducted by Antarctic researchers. We support the continued timely dissemination of these findings to policy makers and the world population in general. At the same time, we underline the importance of leading by example by minimizing the climate impacts of research and logistic activities through reducing greenhouse gas emissions wherever possible. The Scientific Committee on Antarctic Research has recently compiled an excellent report, Antarctic Climate Change and the Environment, summarizing the science on Antarctic climate change. The Norwegian Polar Institute provides mapping and environmental monitoring in the Arctic and the Antarctic. The Institute advises Norwegian authorities on matters concerning polar environmental management and is the official environmental management body for Norwegian activities in Antarctica. In 1998, Mario Soares, former President of Portugal, organized the Independent World Commission on the Ocean, comprising leaders and experts from around to globe, to create an agenda for the sustainability of the oceans. What if men and women led our world in equal measure – would our world and the decisions we make on behalf of future generations be different? Would we be more collaborative, inclusive, more legacy minded and more trustworthy with assets, people and money? The project was established in July 2011 after the joining of two environmental groups, The Alliance for Climate Protection and The Climate Project, which were both founded in 2006 by Al Gore. Among its activities, The Climate Reality Project hosts an annual event called 24 Hours of Reality and, in 2013, launched Reality Drop, a social media tool. There is important work being done every day, at some of the most renowned climate research facilities around the world, to record and study the incredible changes happening in remote places like Antarctica. As you might imagine, gathering critical on-site data on a regular basis would be a virtually impossible task for these groups. So we do it for them, in partnership with research facilities like NASA and the Scripps Institute. Join a community of over 100,000 who are taking our Carbon Challenge and have committed to living low-carbon lives. We ask you to make a personal goal to cut a minimum of 1 tonne of CO2 pollution out of your daily life within a year of joining. It’s easy and we show you how! Our Pollution-Cutting Activity Center has 50+ ways to cut pollution covering – Energy, Money, household, food, travel, shopping, sharing and a special girls section. Each activity has a pollution value attached. Choose the activities that work for you and come back any time you want to add some more. SonTek is a leader in the development of advanced technology that measures the movement and flow of water. And as part of Xylem, a global provider of fluid technology and equipment solutions, we feel it is our responsibility to act as good corporate citizens and leaders in the communities in which we do business. We believe in outreach, education and volunteerism. Our employees are encouraged to come to work every day with an altruistic sense of purpose in knowing that they, along with our customers who are scientists, researchers and water management professionals, contribute to a greater good – getting water to where it is needed most, and protecting communities from floods and other natural disasters. Finally, we believe that when guests participate in these programs, they contribute to a greater understanding of the region in which they travel. Through this heightened level of commitment, they become true ambassadors, returning home to champion for the protection of our planet’s most fragile ecosystems. Through our work, we seek to guarantee the highest possible level of environmental protection for the Antarctic region, whether for tiny but important krill or for entire ecosystems like the Ross Sea. As the environmental observer within the Antarctic Treaty System, ASOC plays a special role as the representative of the global conservation community on Antarctic issues. 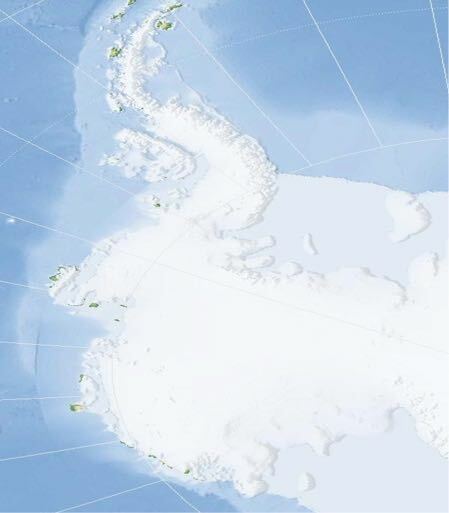 We present papers outlining our positions at the meetings of Antarctic governance organizations, and provide information on how to protect the Antarctic environment to Treaty parties. We can also report back to the environmental community about progress or lack thereof on key conservation issues. Our campaigners are experts in their subject areas and produce analytical papers and reports that are widely respected and cited. Although Antarctica is not often prominent in many people’s minds, ASOC is committed to enhancing public awareness about the continent, its magnificent species, and its unique environmental challenges. We hope you will explore our site to learn more about this stunning region – the natural heritage of all humankind. Winter trapping had long traditions as an activity for men. The few women that participated did so more as housekeepers for their husbands than as actual trappers. Wanny Woldstad from Tromsø was an exception. Wanny was a taxi-driver in Tromsø, in mainland Norway, in the 1930s. She often listened to stories told by the trappers who returned from Svalbard with a profit. They liked to spend some of it going to Ølhallen, the Mack brewery’s bar, by taxi. In 1932 she was asked to join an expedition to Svalbard with Anders Sæterdal and she immediately accepted. “In two-three days I was converted from a taxi-driver in Tromsø to a female trapper on the way to Svalbard onboard Maiblomsten”. In the beginning many of the experienced trappers were skeptical to her participation and abilities as a trapper in the harsh conditions. At 157 cm tall, she was a small woman, but she showed great drive and eagerness to learn and proved that this lifestyle was right for her. The following two years she brought her two sons to Hornsund – Alf and Bjørvik Jacobsen – who later became experienced trappers in Svalbard. Wanny used Hyttevika as her main station. Isbjørnhamna, close to the site of today’s Polish Research Station, was the closest satellite station – it was near here that Wanny shot her first bear, on 12 December 1932. Fuglefjell (Gnålodden) was her second satellite station. “…The Signal is a simple but highly effective contraption: A stick of about 2 meters is planted in the ground about 60-70 meters from the house. A blubber bait is attached by a strong string halfway up the stick. The string is led over a reel at the top of the stick and then over to the house and through a hole in the wall into the innermost room. Here the string is attached to a wooden stick stuck into the hole from the outside. A few empty milk-cans are hung on the stick inside the room, constituting the alarm.” (Woldstad 1956). When the Signal went off she sneaked silently to the loophole, rifle in hand, to shoot the bear. Because of The Signal the dogs had to sleep indoors to avoid scaring away approaching polar bears. Wanny was an exceptional woman, participating in shooting competitions and being Tromsøs first female taxi driver – with her own car in the 1920s. She eventually ended up spending several winters with the experienced trapper Anders Sæterdal. 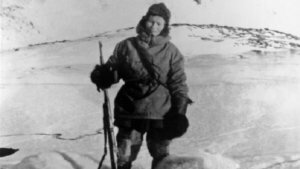 The experiences she made is covered in her book “The first woman trapper on Svalbard”.